Well… My dear friends, SEO is neither cheap nor easy. As a matter of fact, in today’s market if you are looking to hire a company that can do cheap SEO for you, shoot yourself in the foot instead. That way, you save your money and the pain you’ll experience is about the same. Your competition – the one down the street – got to the top of Google for a good reason. How much money are they taking home each day? Hundreds? Thousands? Don’t you think if it was easy or cheap, then everyone would be at the top? SEO requires knowledge, experience, tactical planning, hard-core execution, and vigorous analysis. And who do you know who would give you all of that for 100 bucks? I certainly couldn’t. Neither could my team. Dear blog follower… You’ve seen the kind of advice we give out. You’ve read about our successful clients and you know Google SEO is doable. But always remember nothing good in life comes cheap. Yes, that\’s right. SEO never has been easy because we fight with robots but I think we will win if we can think differently. Thanks! I always find great simple tips and tricks here. Your comment about twettir being a type of social media, not marketing, is an important point. There is nothing worse than businesses continually advertising products or services with little interest in engaging customers and followers on a more personal level.The comment about ratio of followers to following was also relevant. I rarely follow businesses who follow thousands but are only followed by a few. I usually assume there\’s a reason no one wants to follow them. It\’s surprising how many people think they got to the top by means of some super secret SEO technique that no one else knows about (and, oh yeah, at pretty affordable price!). Success online is no different from success offline — if time and hard work isn\’t part of your plan for success, get used to a lot of disappointments w/little forward progress . . .
SEO is neither Cheap nor easy that\’s a very good and true statement first of all. Many companies convince clients by making such promises to deliver best seo at cheap rates but hardly a very few of them approximately deliver satisfactory performance this is because either they fall prey to updates from google or they adopt black hat techniques which ultimately leads to permanent ban of websites from ranking in google in some cases or also due to lack of expertise and experience but, one should be rather too choosey while choosing a company for doing seo specially for those who are opting to get it done cheaply. Always choose a right company on the basis of merit and experience in the field and past experiences of the clients with the company thanks. I Really Appreciate with you, i think Google search engine spam the site if we use cheap SEO…. am i right???? We hope to see you on board soon. I agree that not all expensive SEO\’s are good. I\’ll write an article on how to interview an SEO consultant to know if he/she is good or not. Funny Maryam… that\’s a British proverb, right? You are funny too Dan. So, Good and Cheap will take forever? I think in the SEO world, this rule doesn\’t apply. It\’s too competitive and things change so fast that you have be at the top. 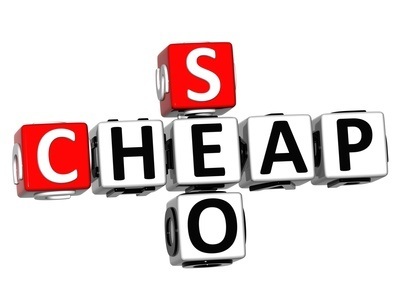 So, Cheap won\’t do it. Period. but you can only have two. Therefore some SEO delivers quick results (it\’s FAST) for little investment (it\’s CHEAP), but won\’t last (isn\’t GOOD). Finally, there is SEO where the quality and quantity of site traffic increases with consistent top listings in search engine result pages, producing sustainable revenue growth sooner rather then later, but it ain\’t cheap nor should it be. When something is cheap there is a reason. We have to look at the SEO services as an investment not an expenditure. You get what you pay for. Buying cheap SEO is definitely in invitation for poor quality services (if we suppose you are lucky and it doesn\’t invite a penalty in Google). CHEAP SEO IS DANGEROUS. I thought you are going to invite your clients for Cheap SEO. Yes. The title means like that. But inside article you are telling the truth about SEO and it cost and execution. I’m sure; a good web business man will understand this clearly. He won’t expect cheap way to become millionaire. Surely, you are right, Ali. The beloved American proverb says \” You get what you pay for\”. Only one little remark. As a rule when we pay cheap, we get cheap. Unfortunately, when we pay some good price, we do not always get good enough service. You are right. If we do not want to spend much money, we have to spend much time and energy. It is well said and very true on some cases. In my experience independent SEO specialist did much better job than those who claims they are the best in industry not to mentioned their sky rocketing fees they charge per month. All you have to know is what to ask and what they will do to improve your site. If you are not well educated in SEO matters, some of them will take you a ride on your own cost. Sure there is very decent and professional ones out there, but also there are lots of shark ones much as good ones. Indeed one of the most competitive market and everyone competes. Thanks for the insight I follow your blog all the time and your advice is always on the line..